Fac­to­rio Nuclear Reac­tors are a new pow­er source in Fac­to­rio 0.15. For those that have played Fac­to­rio, late game setups have includ­ed either thou­sands of steam engines or tens of thou­sands of solar pan­els. This ends up tak­ing both sig­nif­i­cant pro­duc­tion and sig­nif­i­cant game world space. While mass pro­duc­tion is part of the game, the space tak­en by the pow­er sys­tem often dwarfs by orders of mag­ni­tude the oth­er game activ­i­ty. With 2 off­shore pumps,20 steam boil­ers, and 40 steam engines, and a big belt of coal you can get neigh 60 megawatts. As you can see on the left, here, It’s a pret­ty large set­up. It’s enough, gen­er­al­ly, for the first stage of the game… upto mak­ing all the potions, but it starts get­ting dicey at that point. You cer­tain­ly want to also be using coal for smelt­ing as this will not pro­vide that lev­el of pow­er. A sim­i­lar set­up with Solar Pan­els would already be sev­er­al times larg­er (and would con­sume bat­ter­ies and steel to a much greater extent). 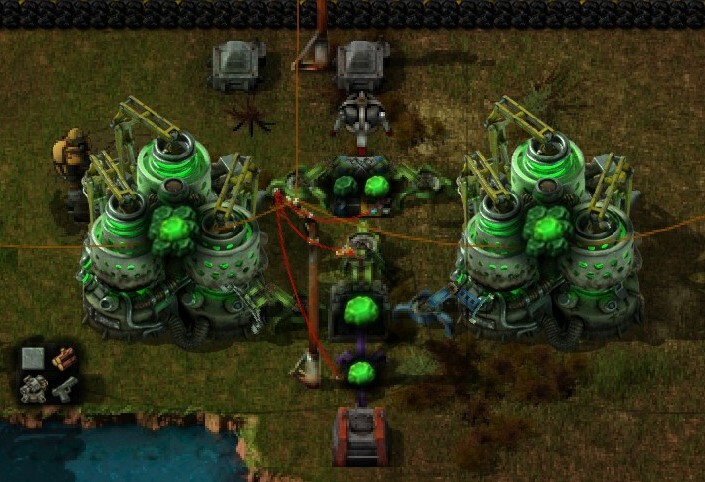 My sim­ple Fac­to­rio Nuclear Reac­tor set­up (shown above) pro­vides 40 MW with one Reac­tor, 160 MW with two, 280 MW with three and 480 MW with four Reac­tors con­fig­ured. I rec­om­mend shoot­ing for the two reac­tor set­up to start because the bonus­es are just so high. But… I’m jump­ing ahead of myself. You need to get there from the start of your game. You can’t even mine Ura­ni­um until you have a source of Sul­fu­ric Acid. In the last few attempts at 0.15 Fac­to­rio, I’ve found that one trick is to start min­ing ura­ni­um as soon as you have Sul­phuric Acid. There is often a patch that will be cov­ered by one or two min­ers near your spawn and I run that into a chest. When you get Fac­to­rio Nuclear, you’ll have sev­er­al thou­sand ura­ni­um ore saved up. Fac­to­rio Nuclear takes an enor­mous amount of research with all five non-com­bat potions. As soon as I get Fac­to­rio Nuclear, I make six cen­trifuges. Make sure you have con­crete ear­ly on. Each Cen­trifuge takes 100 cement. DO NOT set­up your fuel rod fac­to­ry yet. If you did this as soon as pos­si­ble (I only research logis­tic chests first), it will be awhile before you are going to deploy your first reac­tor. For the Koravex process, you’ll want to have 40 U235 on hand. When you get this, put it into your inven­to­ry so that it is not used. U235 in excess of 40 can then be used in a fuel rod fac­to­ry. If you have anoth­er, larg­er patch of ura­ni­um to mine (sev­er­al mil­lion in yield) and if you can set­up a train with a sin­gle tank car (or a very long pipeline) to ser­vice it, these six Cen­trifuges will be enough to run at least 2 reac­tors until that ore patch runs out. With two reac­tors you need one fuel rod every 100 sec­onds and every U235 gen­er­ates 10 fuel rods. So you need one U235 every 1000 sec­onds which is rough­ly 4 per hour. This set­up does make more than that from expe­ri­ence. Look­ing at my larg­er min­ing set­up, you can see two trains. With Fac­to­rio 0.15, you have Flu­id wag­ons avail­able. I only put one flu­id wag­on on this train as it has the capac­i­ty of about 2 stor­age tanks and it’s plen­ty. Any more would even more seri­ous­ly stress your sys­tem. 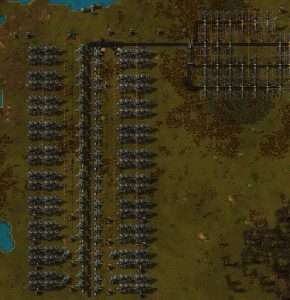 Over the life­time of this ore patch, I think the train made 3 or 4 trips. Sim­i­lar­ly two car­go wag­ons is more than plen­ty to keep the 6 cen­trifuges busy. It’s also worth not­ing that this patch will be exhaust­ed before 25 hours of game­play and it only pro­duced about 100 total U235 by the straight cen­trifuge method. 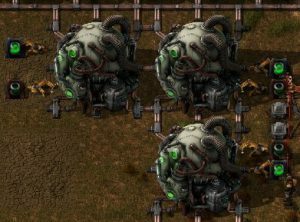 This is why the Kovarex process is so impor­tant. The oth­er result of this min­ing is about 14k (remain­ing) U238, and for every 5 of these, the Kovarex process will pro­duce anoth­er U235. Now for your 40 U235 (that you siphoned off into your inven­to­ry as soon as you had them, above). After your reac­tor has been run­ning for some time, and after you’ve siphoned off your 40 U235, but before your Ura­ni­um ore patch runs out (by a wide mar­gin … sev­er­al game hours), research the Kovarex process. 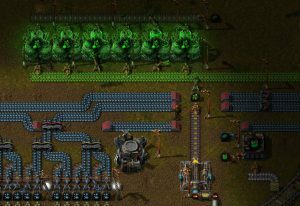 The Kovarex process is just as expen­sive as Fac­to­rio Nuclear to begin with, but the pay­off here is huge. 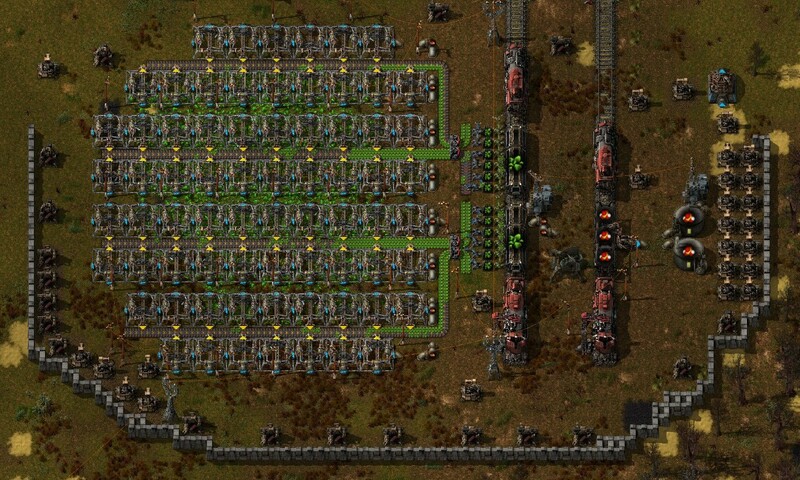 The Kovarex process is mas­sive­ly more impor­tant than fuel recy­cling. The Kovarex process in this set­up will pro­duce 1 U235 every 25 sec­onds. Fuel recy­cling will only net you 3 extra U238 every reac­tor cycle. In the image to the left, both cen­trifuges are set to Kor­vax. The top chest is request­ing 200 U238. The Kovarex pro­ces requires 40 U235 and 5 U238 and pro­duces 40 U235 in 50 sec­onds. I usu­al­ly set up the first centrifuge’s insert­ers and leave the 2nd cen­trifuge idle. The mid­dle insert­er is set to move from the bot­tom chest to the top if the top has less than 40 U235 in it. The insert below that moves from the bot­tom chest to the provider chest when there are more than 39 U235 in the top chest. Like all build­ings, the cen­trifuges will take up to dou­ble their inputs. When the first is get­ting to about 60 (it will top out at 80-ish) then I put the insert­ers point­ing at the 2nd Cen­trifuge. 200 U235 is an embar­rass­ment of rich­es, but between the two of them, they will con­sume 10 U238 and pro­duce 2 U235 every 50 sec­onds. Since each U235 pro­duces 10 fuel rods, This will pow­er upto 80 Fac­to­rio Reac­tors. You can also let your Ura­ni­um ore patch run out as it will now be a long time before you require more. You prob­a­bly don’t need two cen­trifuges here (unless you have more than 40 reac­tors run­ning), but it’s com­pact, cheap and pleas­ant­ly sym­met­ri­cal. So you’ve start­ed ura­ni­um min­ing. Awhile ago you got the Fac­to­rio Nuclear tech­nol­o­gy and you’ve refined enough ura­ni­um to start. How much? If you can refine an extra 10 U235 above the 40 required for Koravex, that will be 100 fuel rods. Enough for 1 2/3 hours of two reac­tors oper­at­ing. 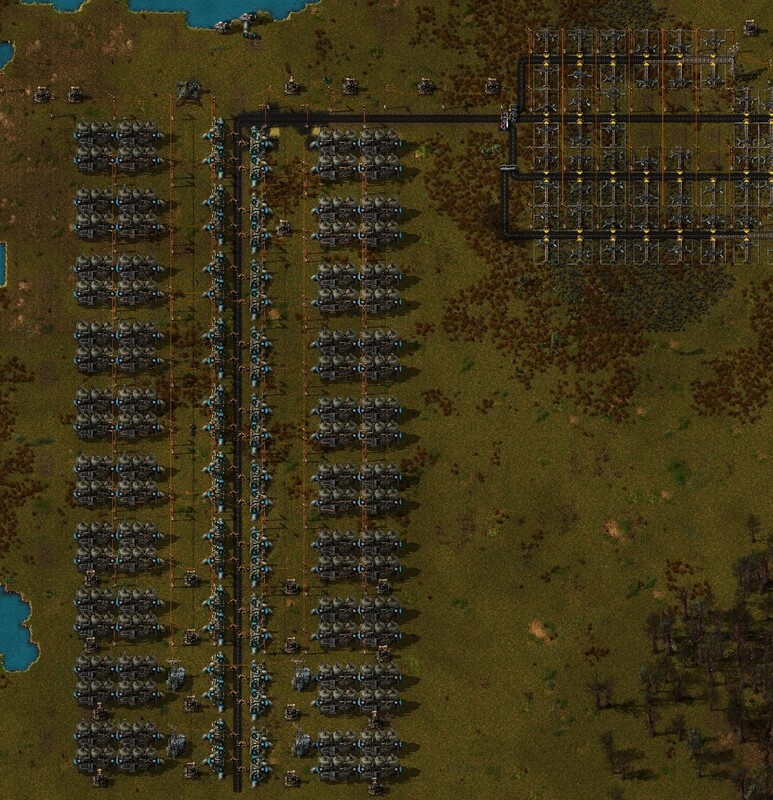 A this point in your game, you can prob­a­bly use the 160 odd megawatts that this will pump out for you. 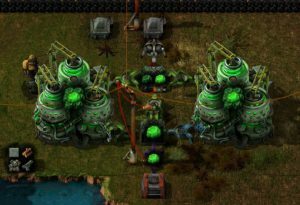 If you have six cen­trifuges going and filled with incom­ing ore, then you should be able to oper­ate two reac­tors while you wait to research and imple­ment Koravex. Now… below this para­graph, I’m going to insert a large pic­ture that is the set­up of the Fac­to­rio Nuclear Reac­tors in my cur­rent game. I start­ed oper­a­tion with 2 reac­tors and 16 heat exchang­ers attached to two off­shore pumps. Each off­shore pump can han­dle up to 10 heat exchang­ers. As I added the third reac­tor, I added 2 heat exchang­ers to each of the two groups to make 10 and added one extra group of 10. That is what you see. 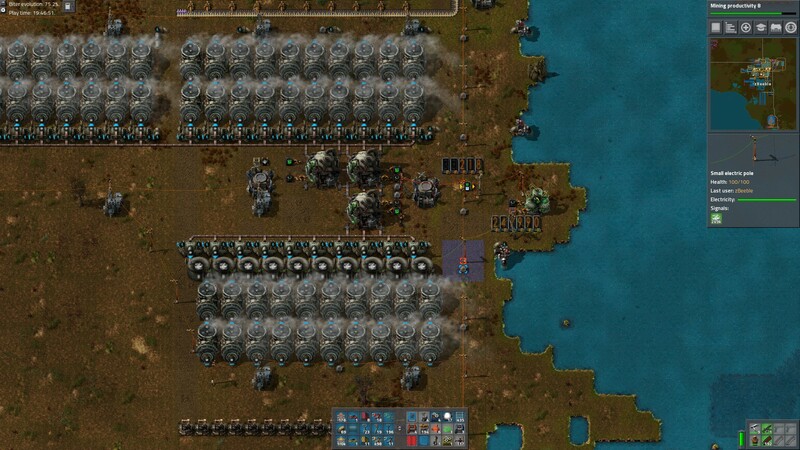 If you’re sharp-eyed, you notice that I have stor­age tanks in the bot­tom row. They off­set the tur­bines by two squares, but at 3 squares wide, they fit right in. We’ll dis­cuss those in a sec­ond. You’ve prob­a­bly already read about the Fac­to­rio Nuclear Reac­tor adja­cen­cy bonus. Sim­ply put, each reac­tor square­ly lined up with anoth­er fueled and active reac­tor pro­duces a bonus reac­tor. One reac­tor by itself is one reac­tor: 40 MW. Two reac­tors side-by-side are equiv­a­lent to four. That is: each reac­tor has one adja­cent reac­tor, so each reac­tor is worth 2 reac­tors… so 160MW. Above, of the three reac­tors, one is adja­cent to 2, so it’s worth 3 and the oth­er 2 reac­tors are worth 2 each for a total of 7 or 280 MW. For four reac­tors in a square (my next upgrade), each reac­tor has two adja­cent (diag­o­nals do not count), so each reac­tor is worth 3 for a total of 12 or 480 MW. When I upgrade to a fourth Fac­to­rio Nuclear Reac­tor, I will top that up with 2 more groups of 10 tur­bines and 2 more off­sore pumps. “Ten?” you say, “isn’t that too many?” Yes, but there is a rea­son. You can store hot steam. A stan­dard stor­age tank stores 25k steam. The stan­dard tur­bines will run at 5.8 megawatts while the heat exchang­ers will only pro­vide 10 megawatts (5 for each tur­bine). When your pow­er sys­tem is run­ning at less than full tilt, it can fill up the stor­age tanks. The extra 1.6 megawatts the two tur­bines on each heat exchang­er can han­dle means 16 extra megawatts per group of 10 for as long as 20 min­utes. Not a bad stor­age sys­tem… or thought of anoth­er way: not a bad emer­gency pow­er sys­tem! Last­ly, it’s a good idea to cable the stor­age tanks togeth­er and put an alarm on them. It’s good to know when you need more pow­er and you’ll know when the amount of stored steam drops. Ten tanks store 250k. I alarm at 200k — so 5 min­utes into my 20 minute over­age. What Does Running Out of Power Look Like? Fac­to­rio Nuclear Reac­tors heat up to 1000°C. In Fac­to­rio (at least for now), they don’t explode, but at 1000°C, you’re prob­a­bly wast­ing some pow­er. Wast­ing any­thing seems anti­thet­i­cal to most types of Fac­to­rio play­ers, but you have few options with Fac­to­rio Nuclear Pow­er. At the moment, steam tur­bines have the same pow­er pri­or­i­ty as steam engines, so the only com­ple­men­tary pow­er source is Solar, but even with Solar pow­er, your accu­mu­la­tors are going to make it dif­fi­cult, if not impos­si­ble, to com­plete­ly effec­tive­ly run only a base load on Nuclear. Any­where above 500°C, heat exchang­ers will be able pro­duce their 10MW of pow­er. Like the steam engines and boil­er, when pow­er is not required, the tur­bines will use less steam and as steam backs up, the heat exchang­ers will con­sume less heat. Unlike the coal-steam sys­tem, how­ev­er, the reac­tors con­sume a con­stant amount of fuel. Two things come out of this. One is that the reac­tor and heat­pipe sys­tem have a “heat capac­i­ty.” This is what gov­erns the time it takes for the reac­tor sys­tem to “start up” and this con­tains some amount of pow­er as heat over 500°C. The oth­er is that mon­i­tor­ing the tem­per­a­ture of the reactor(s) will give you some idea of your pow­er sit­u­a­tion. A falling tem­per­a­ture means you’re dip­ping into your “emer­gency” pow­er and a ris­ing tem­per­a­ture means you’re using less pow­er than you’re cre­at­ing. If your reac­tor (or, more like­ly, your fur­thest away heat exchang­ers) fall below 500°C, they will stop pro­duc­ing steam. In turn your tur­bines will spin down. Since they aren’t using pow­er, they should short­ly recov­er when heat from the reac­tor puts them back over 500°C. If you took the last section’s advice and used stor­age tanks, as the tur­bines stopped, the vol­ume in the tanks were decrease. This can be rout­ed to a map-wide alarm. The advan­tage here is that you have rough­ly 15 min­utes of peak pro­duc­tion to sur­vive that biter inva­sion and solve the pow­er prob­lem. The opti­mal num­ber of heat exchang­ers for 3 reac­tors is 28 and for 4 reac­tors 48. I round up to 30 and 50. It looks nice and it has slight­ly more emer­gency pow­er, too. I haven’t cre­at­ed a need for more than 4 Fac­to­rio Nuclear Reac­tors yet. If I did, I’d be strong­ly tempt­ed to cre­ate a sec­ond sep­a­rate instal­la­tion. This has more redun­dan­cy and resilien­cy in the case of attack. Com­bined, that’s almost a gigawatt of pow­er. Maybe the grand take-away is that rough­ly 4 heat exchang­ers per effec­tive reac­tor are “cor­rect.” Off­shore pumps group those heat exchang­ers into rough­ly groups of 10. Weath­er you take the extra 0.8 megawatts per tur­bine as extra emer­gency pow­er based on sys­tem heat soak or you have stor­age tanks for your steam, I think that emer­gency pow­er is the bet­ter use. Those who try to find opti­mal ratios that use all of this amount are some­what mis­tak­en. Tur­bines are cheap, after all. 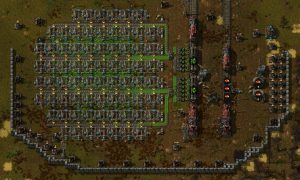 This entry was posted in Factorio and tagged factorio, factorio 0.15, factorio nuclear, games, nuclear. Bookmark the permalink.